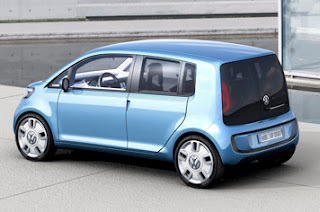 Motor Mania Buzz: Concept Car: Volkswagen Space Up! 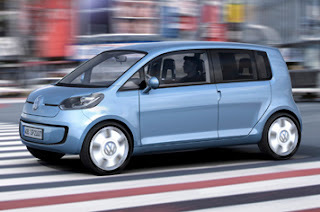 This long-wheelbase micro mini-van will go into production as part of a new three-model city car range from Volkswagen. Previewed as the Space Up! concept at this week’s Tokyo motor show, it’s taller and longer than the Up! The new micro mini-van will seat 4 people in comfort. VW said that development work has already begun on the production models that will be resulting from the concept cars with the first vehicles due on sale in 2010. They will all use a rear-engined platform with petrol, diesel and hybrid powertrains. Measuring at 3680mm long, the Space Up! is 230mm longer than the two-door model and has a longer wheelbase but it’s still shorter than the Fox, the smallest car VW makes. VW describes it as a van but it has two rear seats, which fold, swivel and can be removed to create up to 1005 litres of luggage space. It’s likely that the production Up! 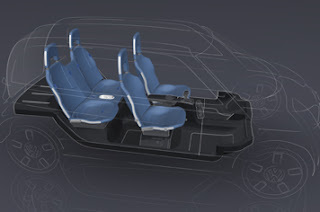 will use a seat foam that moulds itself to the occupant’s shape, while the car’s interior and touchscreen monitor will also make production. The rear hatch has been replaced by van-style split rear doors. VW hasn’t finished with city car concepts just yet, the third and final concept will be at the Los Angeles motor show in November.